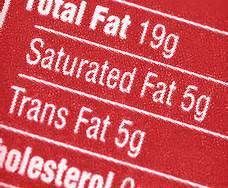 FDA Bans Trans Fats – Good News, or is it? The FDA has just taken a small step for our health by proposing to ban added trans fats in the American food supply, citing its role in increasing cholesterol levels, which leads to the clogged arteries that cause heart disease and most strokes. Trans fats, also termed partially hydrogenated fats and oils, have been used to extend the shelf life of various food products, among other uses. In fact consumption was already way down. While average consumption of added trans fats was almost 5 grams a day in 2003, it had already dropped down to less than 1 gram in 2012. Estimates are that as many as 20,000 lives may be saved by this move – a good thing. So what’s the problem? The problem is that many manufacturers are replacing trans fats with artery-clogging, saturated animal fats which are not much better. Saturated animal fats are powerful when it comes to raising cholesterol levels. They also lead to decreasing insulin sensitivity which fuels Type II diabetes. When we consider that heart disease is still the leading cause of death, that stroke is 3rd leading cause, and that diabetes rates are soaring, this latest move by the FDA is really only a baby step in the right direction. Also, the FDA ban does nothing to address the trans fats naturally occurring in both meat and dairy. Recent studies show these trans fats to be even worse than the artificial trans fats currently added to so many different products. What’s really needed to make a big difference in the health of our nation is a ban or limit on animal fats, which are all high in saturated fat. Animal fats, both saturated and unsaturated, are not only the prime culprits behind heart disease, stroke and diabetes, but they contain highly concentrated levels of pesticides and industrial toxins such as PCB’s and dioxin, which promote several different kinds of cancer. All these diseases kill way more people than just the 20,000 people saved by the latest ban. It’s time for the FDA to finally step up to the plate and actually ban or limit animal fats, or at least put a warning label on the package. One of the reasons they hesitate to do so, presumably, is because so many people eat them. Yet when cigarette smoking levels were very high, the Surgeon General had the courage to state that smoking causes cancer and to put warning labels on the package. Indeed, the front cover of the current issue of Good Medicine magazine, published by the Physicians Committee for Responsible Medicine in Washington DC, states that “Meat is the New Tobacco”.